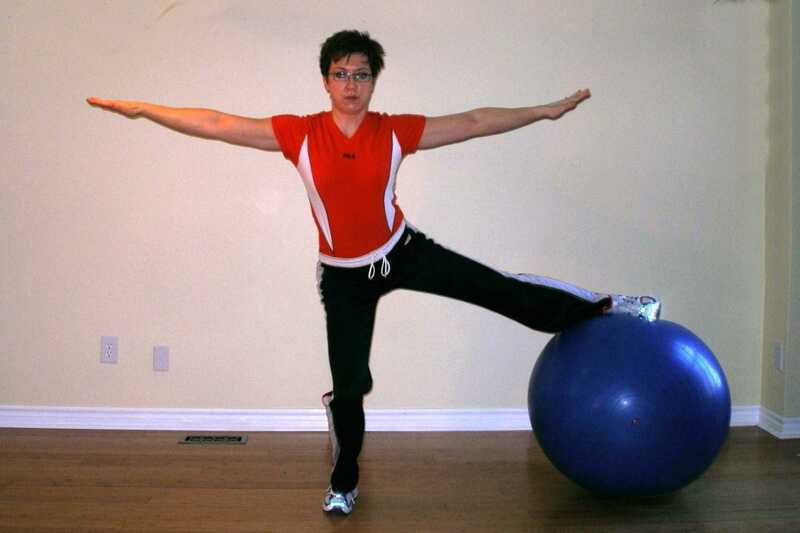 Stand with your exercise ball to your side. Place the inside of your foot on the ball. Lift your arms so that your shoulders are at 90 degrees. Lower yourself down as far as you can go while still maintaining control. This exercise requires good hip adductor flexibility. Keep your knee directly under your hip and your knee directly over your second toe. Do not allow your knee to sway inward as your drop into the squat. To avoid knee injury, do not allow your knee to pass beyond your toes. Try this exercise with your eyes closed to challenge your balance. Try it with your supporting leg on a cushion, folded towel, or BOSU. This is another ball exercise in standing that assists balance, proprioception, and strengthening of the hip abductors in the weight bearing leg. Weakness in the hip abductors has been correlated to recurring back pain.